There is a lot of news today on Hyatt’s change to their loyalty program. In March 2017 Hyatt Gold Passport will become World of Hyatt. The M life/Hyatt status match will also be changing in 2017. According to View from the Wing and others, with Hyatt’s Gold Passport conversion to World of Hyatt, the status match will also change. Under the new system the highest Hyatt level will only get you to Gold, so Hyatt members won’t get as much benefit from their status when visiting Vegas. 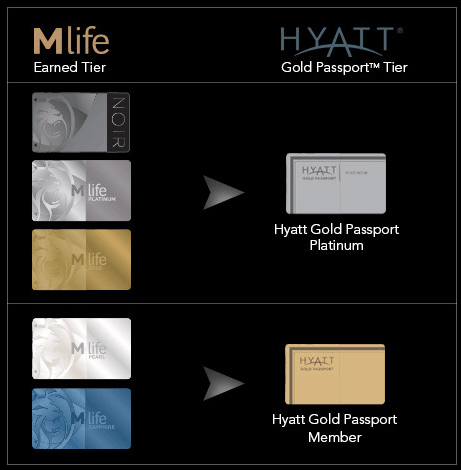 Under the new system M life Gold and above will get Explorist status (which is better than the current Hyatt Platinum status, though not as good as Diamond) and Pearl will get you Discoverist (a step above basic membership). This creates a shortcut to Hyatt Explorist Status. M life Gold status can be reached by accumulating 75,000 tier credits. That can then be matched to Hyatt Explorist status. In my opinion, this is much easier to reach than 30 nights staying at a Hyatt. Slightly more than $2,800 spent at M life properties (room, food/beverage, etc) would get you M life Gold status and Hyatt Explorist status. If you have an M life Rewards MasterCard, it would cost just over $2,100 of spend at M life properties. And that doesn’t include any gambling you might do. Compare that to 30 nights at Hyatt properties. Or the alternative way to get Explorist status which is by earning 50,000 Hyatt base points through roughly $10,000 spend at Hyatt properties (less if you have the Hyatt Visa). For now it is much easier to earn Hyatt Explorist status through M life stays than it is through Hyatt stays. I’m guessing Hyatt will want to recalibrate this in the future. In other news, M life will be increasing their resort fees. As of November 8 (Election Day in the US), M life will increase resort fees at six of their Las Vegas resorts. Reported earlier this week by vegastripping, today I confirmed the change with MGM Resorts International Corporate Communications. The resort fees at Bellagio, Aria, Vdara, Luxor, Excalibur and Circus Circus (yep, still an M life property) are all increasing $3 + tax.